This wonderful chalkboard image sums things up beautifully - but it's been used on many blogs before mine, making it difficult to source and credit the originator. Help, please? 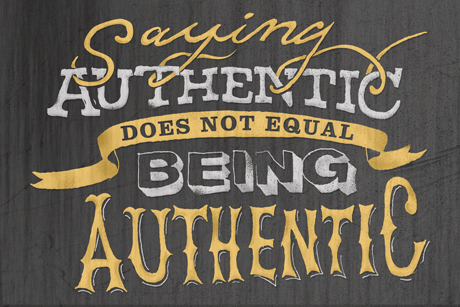 We all know that using a word doesn’t actually “make it so,” and that goes for the word “authentic.” The same can be said for words like “handcrafted,” “groundbreaking,” “passionate,” “artisanal,” “luxury,” “reserve” and, well, I’m sure you get my drift. “Authenticity became a buzzword when marketing gurus identified an important new consumer group seeking something ‘genuine,’ who’d been left feeling empty and disconnected by the hyper-consumerism of the past. Sadly, all true. Once the corporate world twigs to a hitherto unexpressed desire among consumers, you can be sure that a catchword won’t be far behind. 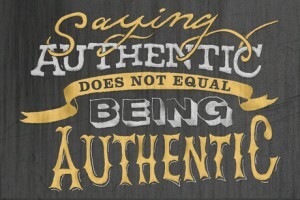 I’m afraid “authenticity” currently fits that niche in ersatz wine marketing. Differentiating your wine is all about the details that you own and no-one else can claim. Authenticity will be understood “as read” by consumers when they learn more about your company’s history and its approach to viticulture and/or winemaking. In its defence, though, I’d argue that the A word still has one important role to play. When fans of your wine offer word-of-mouth recommendations to their friends, guess which A word they’re going to use? That can only be a good thing. Posted in Brand management. Bookmark the permalink. Post a comment or leave a trackback: Trackback URL.